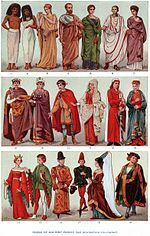 A modern gown refers to several types of garments. It can refer to a woman's dress, especially a formal, or especially fancy dress. It may also refer to a nightgown or a dressing gown. In academia, gowns are also worn for various occasions. "Gown" in the modern sense generally refers to a ball gown. ^ a b c d e Wilcox, Ruth Turner (1969). The Dictionary of Costume. New York: Batsford. p. 152. ISBN 9780713462777. ^ a b c Picken 1957, p. 153. ^ a b Waxman, Olivia B. (10 May 2017). "The Real Reason Grads Wear a Cap and Gown". Time. Retrieved 2018-01-26. ^ a b Fabretti 2008, p. 23. ^ a b Fabretti 2008, p. 25. ^ Fabretti 2008, p. 72. ^ a b Staples & Shaw 2013, p. 269. ^ a b Staples & Shaw 2013, p. 272. ^ "Classic night gowns for men and women". morgenkaaben.dk. Retrieved 15 April 2016. Kemp, Roger L. "Town and Gown Relations: A Handbook of Best Practices," McFarland and Company, Inc., Publishers, Jefferson, North Carolina, USA, and London, England, UK, (2013). ( ISBN 978-0-7864-6399-2).